A Kiss For the Petals: Maidens of Michael Countdown – 8 Days Left! 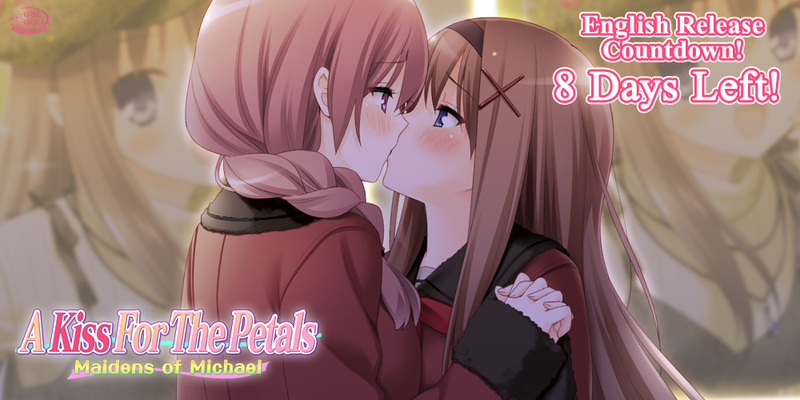 We’re now eight days away from the official English release of A Kiss For the Petals: Maidens of Michael! Sara: Kaede-chaaan! Kaede-chan, why don’t you try doing modeling work with me? Kaede: D-Don’t be ridiculous. Besides, a plain girl like me could never make it as a model in the first place. Sara: Awww. You could achieve idol status if you wanted to though, Kaede-chan. Such a waste. Kaede: But idols have to sell their bodies to people like their producers. I won’t allow anyone to have their way with my body but my l-loved one. You of all people should understand that, Sara. Sara: Kaede-chan, you’re just too cute! Sara: “A Kiss For The Petals – Maidens of Michael” goes on sale in eight more days! Tagged maidens of michael, sonohana, yuri, yurinyurin.